Susan Reinhardt says line to switch flights was "a gazillion deep"
BUFFALO, New York (CNN) -- One person credits bad weather and the other a long line. 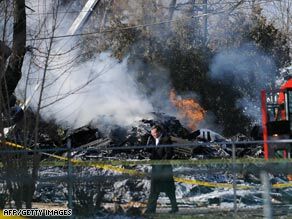 An investigator works the scene of the plane crash Friday outside Buffalo, New York. Those are the reasons two would-be passengers did not fly on Continental Connection Flight 3407, which crashed Thursday outside Buffalo, killing all 49 people aboard and one on the ground. "It could have been me," David Becony said from his home in Springville, New York, as he watched television reports on the crash and its fiery aftermath. "My wife would have been with all those families" who had loved ones on the plane. Becony missed the flight from Newark-Liberty International Airport to Buffalo Niagara International Airport because bad weather had delayed his earlier flight from New Orleans, Louisiana, to Newark. When he found out the plane he was to have taken had crashed, he called his wife, Marti, at their home outside Buffalo. "He broke down, and I broke down," she said. "We just couldn't believe it." Becony spent a sleepless night in Newark and then returned Friday morning to Buffalo -- on another Continental Connection flight. It wasn't a smooth ride, Becony said of his Friday flight. "It was weird, shaky, knowing it was the same type of aircraft." Continental Connection Flight 3407 crashed late Thursday outside Buffalo, killing all 49 people aboard and one on the ground. That type of aircraft was a Bombardier Dash 8 Q400 aircraft, operated by Colgan Air for Continental Connection's regional service. "I'm still in shock, really," said 49-year-old Becony, a Catholic. "God was looking over me." Becony is keeping his unused ticket for Flight 3407 as a reminder of how close he came. His wife said friends and family called all morning to check on his safety. "It is wow," she said. "It's been unbelievable. We're happy. We're sad for everybody else." Asked how her husband's close call would affect the family, which includes two children and two grandchildren, she said, "I think we'll probably appreciate each other a lot more." Susan Reinhardt, 49, a marketer for Verizon, had a confirmed seat on a 4:30 p.m. flight from Newark to Buffalo, but it was delayed for four hours because of bad weather, and she was looking for alternatives. Using her Blackberry to search Continental's Web site, she noted that the 7 p.m. flight was delayed by only about 20 minutes, so she asked the gate agent whether she could get on the standby list for that flight. "He said, 'It's pretty open ... easy eight standby seats. You won't have a problem getting on it,' she said . "I said, 'Can you put me on standby?' He said, 'No, you've got to go on the customer service line.' "
But that line "was a gazillion deep because of all the delays," enough to dissuade her from making the switch. "I said, ehhh." When she heard about the crash, Reinhardt was happy for her good fortune but shaken nevertheless. "The heart-wrenching piece for me was, I was at the gate talking to this gate agent, and a young woman came up and she wanted to know: Should she stay on the 7 o'clock flight because of all the delays? Did the gate agent think the 4:30 was going to get out before the 7? "He said, 'No, you will still get in before the 4:30,' and she said, 'OK, I'm going to stay on the 7 o'clock; I'm calling my boyfriend.' And she did." For a while, the two women stood together at the gate, both of them using their Blackberries to study the flight information. Then, they went their separate ways. "I said, 'Good for you. Have a nice trip.' That's the killer for me." Reinhardt said her flight was uneventful. She and the other passengers landed at the airport in Buffalo shortly before 11 p.m., oblivious to what had happened just minutes before and a few miles away. "They were waiting for that plane that didn't come in. Of course, I didn't know that until I got to my car, and then my phone starts ringing." Reinhardt said the close call has made her "a little more philosophical where, if it wasn't my time, OK, it wasn't my time. What is the meaning of my life now? What am I supposed to do because it wasn't my time? I've had several people say, you know, sometimes you can't ask why. It just is the way it is." Reinhardt said she plans to go to one of the memorial services. "I think I need to do that for some kind of closure."